A survey of dentists reveals that 65% do not believe that an economic recovery is on the horizon, feeling that the chances of recovery went away after Obama was reelected. This week, in Ben Bernanke’s latest speech on the state of the economy, he emphasized cooperation and creativity to deliver fiscal clarity–in particular, a plan for resolving the nation’s longer-term budgetary issues without harming the recovery–could help make the new year a very good one for the American economy. 29% of the dentist respondents to The Wealthy Dentist economic survey believe that perhaps they are seeing an economic recovery on the horizon, while 4% believe that an economic recovery is already here. 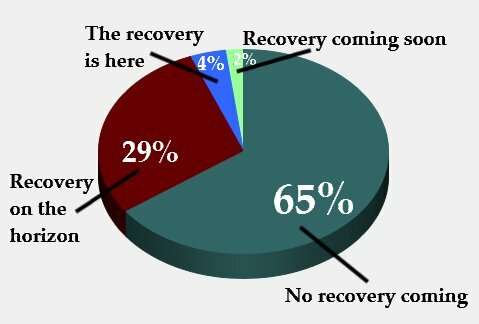 2% think a recovery is coming soon. “Recovery is here but it is slow and not very energetic. We should be glad our recovery is growing and not declining into recession like most of the world!” responded an Illinois dentist. The generally negative tone of the survey responses do not mean that dentists have not seen success at their dental practice. What are your thoughts on the future of the U.S. economy? Do you see a economic recovery on the horizon?